Task-shifting in mental health such as engaging Traditional Health Practitioners (THPs) in appropriate management of mental disorders is crucial in reducing global mental health challenges. This study aims to determine the outcomes of using evidence-based mental health Global Action Programme Intervention guide (mhGAP-IG) to provide psychosocial interventions among depressed patients seeking care from THPs. THPs were trained to deliver psychosocial interventions to their patients screening positive for mild to severe depression on Beck’s Depression Inventory (BDI). Assessments were conducted at 0, 6 and 12 weeks and Analysis of Variance (ANOVA) performed to determine the change in depression scores over the three time period. BDI mean score was 26.52 before intervention and reduced significantly at 6 (13%) and 12 (35%) weeks after intervention. 58 and 78% of patients showed reduction in symptoms of depression at 6 and 12 weeks. It is therefore crucial to engage THPs in the care of patients with depression and the need for inclusion of training packages; and other mental disorders in order to establish and maintain collaboration between THPs and conventional health workers and promote evidence-based care among marginalized populations. Moreover, further research on randomized control trials of mhGAP-IG intervention versus usual care is required. This work was supported by Grand Challenges Canada (GCC) (grant number S5_0415-01) to the first author (PhD candidate, Vrije Universiteit) and implemented by Africa Mental Health Foundation under the supervision of the corresponding author. GCC had no role in the study design, data collection, analysis, interpretation, writing of the manuscript or in the decision to submit the manuscript for publication. CWM conceived, designed the study and wrote the protocol; performed data analysis and wrote the first draft of the manuscript. All supervisors (DCH, DMN and JB) were involved in manuscript review and approving the final version of the manuscript. VNM played a key role in coordinating data collection, data entry and cleaning, analysis and interpretation of data and provided critical revisions to the manuscript. The corresponding author had full access to all the data in the study and had final responsibility for the decision to submit the manuscript for publication. Niekerk, M. A. van Dladla, N. Gumbi, L. Monareng, and W. Thwala 2014 Perceptions of the Traditional Health Practitioner’s Role in the Management of Mental Health Care Users and Occupation: A Pilot Study [WWW Document]. South African Journal of Occupational Therapy 44 (1): 20–24. URL http://www.scielo.org.za/scielo.php?pid=S2310-38332014000100005&script=sci_arttext, accessed January 18, 2016. Phang, C., M. Midin, and S.A. Aziz 2010 Prevalence and Experience of Contact with Traditional Healers among Patients with First-Episode Psychosis in Hospital Kuala Lumpur [WWW Document]. Malaysian Journal of Psychiatry 19 (2). 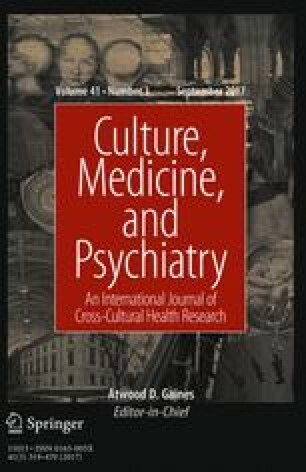 URL https://www.researchgate.net/publication/257853716_Prevalence_and_Experience_of_Contact_with_Traditional_Healers_Among_Patients_with_First-Episode_Psychosis_in_Hospital_Kuala_Lumpur, accessed January 25, 2016. Read, U.M., E. Adiibokah, and S. Nyame 2009 Local Suffering and the Global Discourse of Mental Health and Human Rights: An Ethnographic Study of Responses to Mental Illness in Rural Ghana [WWW Document]. Globalization and Health. doi: 10.1186/1744-8603-5-13.